Blog: Can I Plant Trees in the Fall? Late October to mid-December is the ideal time for tree planting in Central Ohio because it allows the roots to become established before the ground freezes and winter sets in. The fall moisture (rains) helps the trees and shrubs establish their root systems. When the air temperatures are cooler than the soil, new root growth is encouraged without new top growth. 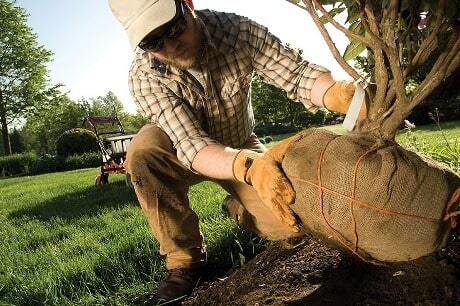 A fall planting allows the tree to establish strong roots in the Fall and again early Spring before leaves develop. This gives the tree a good chance to lay down a good set of roots before they need to collect water and nutrients for the leaves. Blackgum or Black Tupelo (Nyssa sylvatica) The simple leaves of this easy-to-grow, regal tree turn from rich green to brilliant scarlet red in fall. Common Dogwood (Cornus florida) Best known for its outstanding spring blooms, dogwoods also offer outstanding fall leaf color in shades of purple, orange, and red. Freeman Maple (Acer x freemanii) This outstanding landscape tree is a hybrid of the fast-growing silver maple (Acer saccharinum) and red maple (Acer rubrum), two common Ohio native trees. Common Serviceberry (Amelanchier arborea) It also offers white spring flowers, edible summer fruits, and smooth gray branches, but its orange-yellow-red fall color is especially impressive.